Hi and welcome to a new challenge for La-La Land Crafts. Today we are celebrating Christmas in August, so we are sharing Christmas cards made with La-La Land Crafts stamps. So for today's card I decided to use Building Snowman Maya. To me, this image is just so adorable and she sure was fun to color in as well! I used Cosmo Cricket papers and here is what it looks like. So......what do you think??? Isn't this a cute card???? 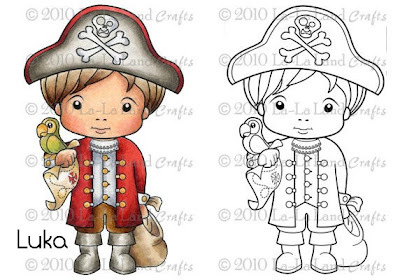 Can you imagine making the cuuuutest Halloween card with Pirate Luka???? I sure can! I am sooo amazed the way Irina colored him in and I got to see it in person, too...soooo cute! I can't wait to color him in...that is for sure! 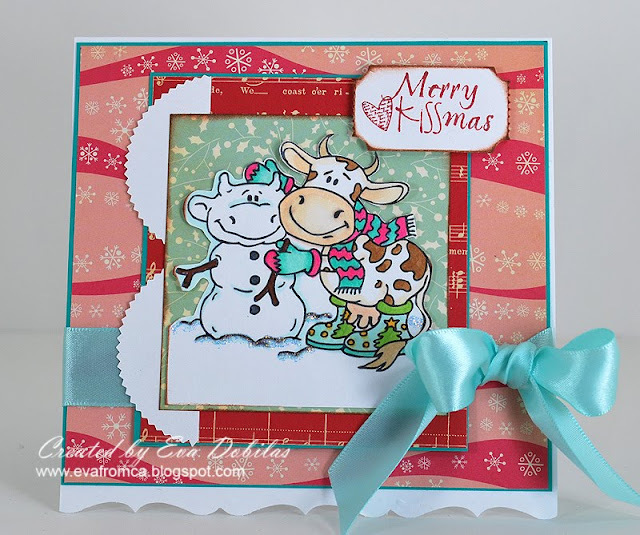 Make sure you hop on over to the La-La Land Crafts blog to see all the designer's cards, as I know they are amazing! Hope you play along our challenge, too! Have a fabulous day and thank you for visiting!